A little bit of foto art to brighten an otherwise dreary day! The above memory of summer days is the work of local photo artist Sheryl Falls. You can see more of Sheryl's handiwork at www.f-stop-foto-art.com. The 2010 Olympics are approaching, but the scams have already arrived and more are expected to emerge over the coming weeks. The Olympic Games begin on February 12, 2010 in Vancouver-Whistlers, British Columbia and BBB expects to there to be a rise in frauds related to counterfeit tickets, bogus Olympic merchandise, rental properties, problems with travel packages and possibly other scams. Counterfeit Tickets: Just about every sporting and entertainment event has issues with counterfeit tickets. If you are in search of last minute tickets to an Olympic event be very wary of the source from which you are purchasing your ticket. Authorized fan-to-fan tickets can be purchased by Canadian and U.S. residents via the 2010 Olympics official website at www.vancouver2010.com. VANOC will also host regular public online auctions for tickets remaining prior to the event. Click here to see more in-depth information about Olympic Tickets. Bogus Olympic Merchandise: Be aware of knock-off Olympic memorabilia, including collectibles and sportswear being sold near sports venues and online. Not every product with the Olympic logo on it is necessarily an authentic, licensed Olympic product. Consumers are encouraged to familiarize themselves with the official 2010 Winter Olympics logos, graphics and branding and consider shopping directly from the www.vancouver2010.com, the official 2010 Games website. Click here for more in-depth information on Olympic merchandise. Rental Property Scams: Phone ads for British Columbia rental properties are popping up on Craigslist and other online classifieds. Scams typically require the victim to wire a large deposit of money to the supposed landlord in order to receive the keys to the rental home. The money is wired and communications stop. Victims lose their money and a access to place to stay during the event. If you are looking or accommodations during the 2010 Games, the Olympics has an Official web site www.2010destinationplanner.com that provides a list of hotels, bed and breakfasts, private home rentals and rooms on cruise ships that are available. Click here for more in-depth information on Olympics accomodation. Problems with Travel Packages: Millions of people are expected to arrive in Vancouver-Whistler for the Olympics, making accommodations and travel options limited in the area. Before making travel plans be sure you know who you are doing business with. Check Canadian tourism businesses out at www.bbb.org. Travel agencies should be licensed with Consumer Protection BC and Property Management fires with the Real Estate Council of B.C. To ensure your trip is a success be sure to confirm all reservations for hotels, rental cars or other similar rental arrangements before arriving, and bring all confirmation numbers, record of price or rates quoted, or other verification with you. The Nanaimo Things To Do Directory has over 160 different contacts for every interest from Air Cadets to Windsurfing and everything in between. To visit this directory click the banner above or Nanaimo Info LINK. After several months of preparation and promotion, followed by a thorough judging process, thirteen films have been selected for the 5th annual Nanaimo Arts Council - Vancouver Island Short Film Festival. This year we were flooded with great original short films. 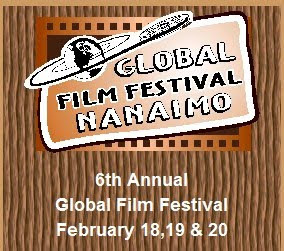 Over the past weeks, a three person jury selected 13 films that will be shown at the festival on February 12th and 13th - 7 PM - at the Malaspina Theatre at the Nanaimo VIU campus. The festival will include a screening of the 13 selected films and an awards ceremony for best films in several categories with prizes for winning filmmakers. The selected films include Boingo Boingo by Mark Benard, Come Clean by Alina Cerminara, Desolation by Steve Harrison, Detective Fawkes and the Victem's Vixen by Todd Jones, Mercenary Soluctions by Graham Stark, Riboflavin by Blair Dykes, Smothered by Linley Subryan, The Button by Jeremy Klassen, The Mechanic by Michael Grand, The Nastiworths by Kristina Durst, The New Dad's Survival Guide by Michael Chen, The Piano Player's Sister by Tash Baycroft & John Gardiner and The Secret of the Sauce by Graham Stark. 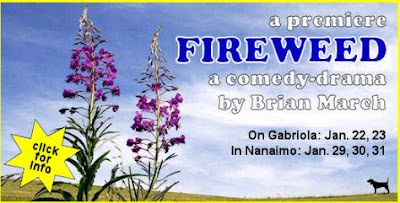 Tickets are available in the Nanaimo Arts Council Gallery in Nanaimo North Town Centre, Falconer Books at Port Place Mall, the Nanaimo Art Gallery at the VIU campus, the House of Indigo Boutique in downtown Nanaimo and at the door. Tickets are $15. 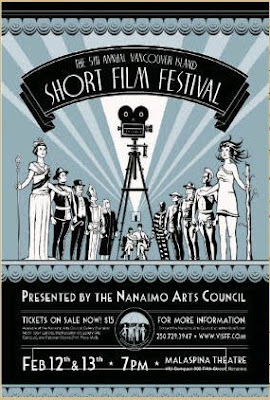 The Vancouver Island Short Film Festival is a Nanaimo Arts Council event. The Nanaimo Arts Council is dedicated to the promotion, development and support of all the arts in Nanaimo and area. Information on the Vancouver Island Short Film Festival is available on the website at www.visff.com. For more information, contact admin@visff.com or phone 250-729-3947. From March 12 to 14, 2010, at the Cowichan Lake Education Centre, some of Canada's premier fiddle players will share their skills and passion with fiddle and piano students of all ages and abilities. 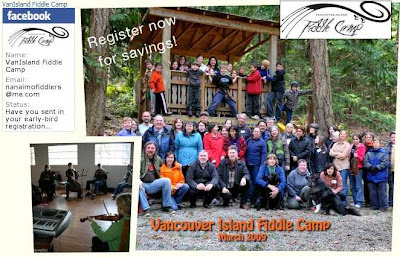 The Nanaimo Conservatory of Music is presenting the third annual Vancouver Island Fiddle Camp, and this year promises to be better than ever! 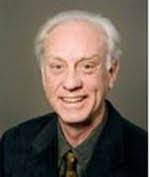 The faculty at the 2010 camp includes Gordon Stobbe (fiddle, Seaforth, N.S. ), Geoff Horrocks (piano and fiddle, Ottawa ON), Mark Sullivan (fiddle, Vancouver BC), Patti Lamoureux (fiddle, Courtenay BC), Miriam Sonstenes (fiddle, Victoria BC), Zav RT (fiddle, Salt Spring Island BC) Lesley Clarke (visual arts, Nanaimo BC) and Trish Clair-Peck (fiddle, Nanaimo BC). These teachers are in demand at camps and workshops across the country and always deliver excellent and inspiring instruction. Campers will study specific fiddle styles, offered for every level from beginner to advanced, in small group classes. They also participate in family dances and jam sessions and are treated to a spectacular performance by the instructors at the Cowichan Lake Community Hall. In past years, the camp has been attended by fiddle students aged 5 to 55+ from as far away as Toronto. There is truly something for everyone at the VI Fiddle Camp. This camp grew out of the Nanaimo Fiddlers program, and is one of the most exciting and dynamic new initiatives at the Nanaimo Conservatory of Music. Registration is now open and there are great early-bird savings for those who register by February 1, 2010. Visit the website for more information, or call 250-754-4611. The Nanaimo Arts Council is pleased to feature the work of Micki Findlay, Vancouver Island photographer, through the month of February. The show is entitled ‘Digital PhotoArt with Pizzazz. 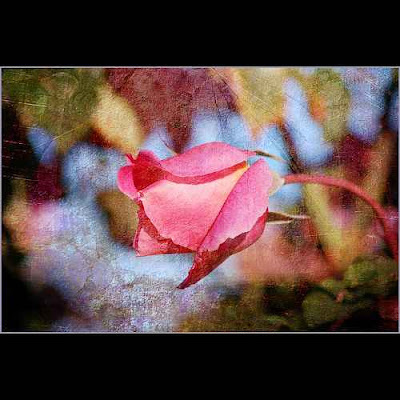 Micki is an award-winning, creative, freestyle 'photo-artist' who has a passion for the arts. Her most cherished art forms include the theatre, music, jewelry design and computer graphics. She was to discover, later on in life, that she possessed a love for photography after receiving a digital camera from her husband. Micki has an excellent eye for artistic detail, while utilizing her computer graphic arts skills, she lovingly pours hours into her craft to perfect it, creating a contemporary, unique, artsy feel to her images. Micki has a knack for bringing her images ‘to life’ with her post-processing techniques and use of vibrant colours. 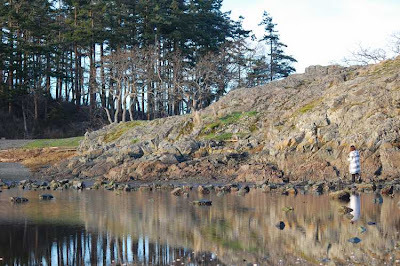 Micki notes, “Living on breathtaking Vancouver Island, I am never at a loss for inspiration”. Micki will be onsite, at the gallery, on Wednesday afternoons, from 1:30 PM to 5:30 PM, throughout the month of February. For a preview of Micki Findlay's work use this LINK. A new dog handler requires a minimum of 750 hours or four months of training. The RCMP Police Dog Service implemented an in-house breeding program in 1998. The RCMP Puppy Program located in Innisfail, Alberta produces on average 120 German Shepherd puppies a year from proven stock. Children across Canada name each of the dogs through the “Name the Puppy Contest”. 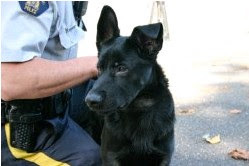 Over 50%, or 70, police dogs currently working in the RCMP were bred in RCMP Puppy Program. Police Dogs can indicate a person up to 300 to 400 yards away. The dog has a sense of smell that is a thousand times greater than that of humans. They only need one part per million of scent to get a detection. Dogs can work up to four hours with rest intervals. There are currently 79 Police Dog Teams across E Division (British Columbia) and 44 in the Lower Mainland which is integrated with the Abbotsford Police Department. Healthy police service dogs cost less than $1,000 annually to maintain. There will be 29 great films for viewing on 3 evenings and all day Saturday. Low income passes will also be available at the festival. For more information please visit our website using this LINK. 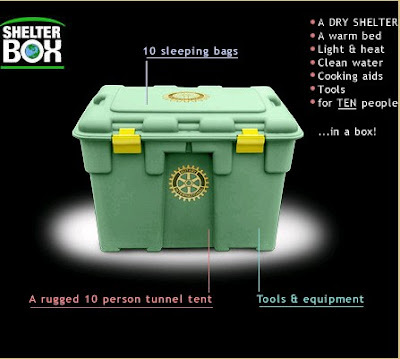 The Shelter Box program is an initiative of the Rotary Club that started in England 10 years ago. Each Shelter Box contains a 10 person tent, 10 sleeping bags, tools and equipment, water purification equipment and tablets, hand crank radio, cooking and eating supplies including a stove (designed to burn anything flammable), the basic necessities to shelter up to 10 people. There will be a donation table set up at VIU on the main floor of the library until Friday and will be staffed from 10:00 am - 4:00 pm each day. Each box costs $1,000 and there are 3,000 boxes scheduled for Haiti with an urgent need for thousands more. If you can help, this is a great way of providing very practical help through a trusted organization who will get the help to those who need it. To learn more about the Shelter Box program visit their website using this LINK. For more information contact Don Bonner at 250-741-8483 or at sales@nisa.com. Be Prepared For 7 Days Not 72 Hrs. Councillor Kipp made the point at the recent council meeting that people who can afford to be prepared with food, water and other emergency supplies for 7 days instead of the popular 72 hrs. are wise to do so. His comment was prompted by observations of what has happened during the recent disaster in Haiti and how long it is taking for relief to actually get through during a major event. Haiti is a good example of what happens to people when they depend on 'the government' to take care of them. Remember it is the same bright minds who have narrowly missed leading the world into financial ruin who are in charge of disaster relief. If you listen to what Councillor Bill Holdom says at the Jan. 25/10 Council Meeting you can't help but wonder if he was very tired that night. It seems the professor has forgotten that 'nickels and dimes' add up to dollars when you put enough of them together. Councillor Bestwick proposed adopting other cost saving cuts which would have reduced this years taxes by nearly another 1%. 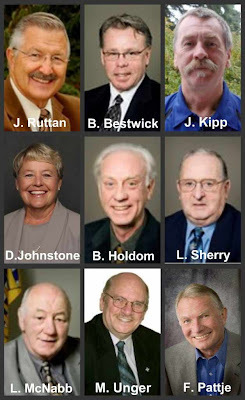 His motion was supported by Kipp, Sherry and Pattje and defeated by Ruttan, Unger, Holdom, McNabb and Johnstone. The reason Holdom offered for not supporting the motion was because he considered the items to be cut as 'nickels & dimes' and not worth supporting. He made some vague reference to dealing with 'larger' items if the budget was to be reduced. Seems like only yesterday he was taking praise for holding the line on taxes by spending money that was in reserves, yet this year thinks a similar reduction in taxes as not worth supporting. If you want to listen to the logic of those on council that would not support reducing your taxes by nearly 1%, go the the video archives of the meeting and advance the playback to 1:20:15/03:26:29. You can access the archives using this Nanaimo Info LINK. Listen closely and you will see why these council members have no interest in holding the line on your taxes, regardless of what they say. I realize that old fashioned thinking is not considered valid these days, but my wise old granny used to say 'take care of the pennies, and the dollars take care of themselves'. Is anyone on council listening??? On Monday January 25th at 2:19am RCMP members responded to a report of a Break and Enter in progress at the Instaloans Financial Solutions business at 1925 Bowen Road. At least 3 males suspects using a stolen pickup truck hooked chains to the front door of the business and gained entry. Once inside, in a matter of a few short minutes, suspects forcefully removed the safe that was bolted to the floor and loaded it on to the waiting truck and fled the scene. The safe contained an undisclosed amount of cash. As a result of this incident the business incurred extensive interior and exterior damage. Information gained in the course of the investigation has determined the the vehicle used in this heist is believed to be a 2002 Chev Silverado Pickup truck, dark green, bearing plate 9450KD which was stolen from Jinglepot Road on Sunday January 24th. "The interior of the business was completely destroyed in the process of removing the safe .The safe its contents and the truck have not been recovered to date" said Constable Gary O'Brien, media spolesperson for the Nanaimo RCMP. If anyone has any information on this incident , please contact the Nanaimo RCMP at 250-754-2345 or Crime Stoppers at 1-800-222-8477(TIPS). Editor's Comment: You have to wonder how long it took to respond, given the bad guys had time to rip off a front door, and then forcefully remove a safe bolted to the floor and then load it into a truck and make a clean getaway. Things that make 'ya say 'hmmmmmm. Maybe they were at the Olympics? Defeat Motion To Decrease Taxes! If you want to know who really is serious about holding the line on tax increases, it was clearly demonstrated last night at the city council meeting. A proposal by Councillor Bill Bestwick which was supported by Jim Kipp, Loyd Sherry and Fred Pattje which would have held tax increases to 1% was defeated. Remember this is the same council that pays $500,000 for someone to stay home, and tells us they are saving us money! If you want to see some changes in how this council keeps spending our grand kids money, get on the phone and let them know what you think. A contact list for Mayor and council can be found using this Nanaimo Info LINK. January 25, 2010 – The Canadian Food Inspection Agency (CFIA) is warning the public not to consume certain Daniele brand salami products, described below, because the product may be contaminated with Salmonella. Gourmet Italian Deli Selection 400 g 7 36436 53013 1 Super C stores in Quebec. Italian Brand Gourmet Pack 500 g 7 36436 70737 3 Costco stores in British Columbia, Alberta, Saskatchewan and Manitoba. Gourmet Italian Deli Selection Tray 600 g 7 36436 72005 1 Costco stores in British Columbia, Alberta, Saskatchewan and Manitoba. Additional products have been recalled by the manufacturer and may have been imported into Canada. For a full list of products, please consult the USDA website: using this LINK. There have been no reported illnesses associated with the consumption of these products in Canada. Food contaminated with Salmonella may not look or smell spoiled. Consumption of food contaminated with this bacteria may cause salmonellosis, a foodborne illness. In young children, the elderly and people with weakened immune systems, salmonellosis may cause serious and sometimes deadly infections. In otherwise healthy people, salmonellosis may cause short-term symptoms such as high fever, severe headache, vomiting, nausea, abdominal pain and diarrhea. Long-term complications may include severe arthritis. The importers are voluntarily recalling the affected products from the marketplace. The CFIA is monitoring the effectiveness of the recall. 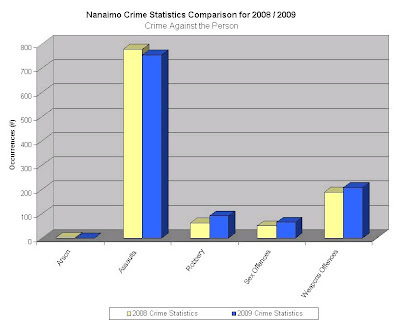 The 2009 Crime Stats for Nanaimo are out and some interesting trends are revealed with theft from autos and shoplifting complaints up by at least twenty five percent. Theft from autos increased by 25 percent while shoplifting complaints increased by almost 32 percent.” These type of offences can vary but are indicative of certain trends within our community “said Constable Gary O’Brien, media spokesperson for the Nanaimo RCMP.”Often drug addicted street criminals regularly target motor vehicles to break into. Items such as GPS units and small change are then quickly handed over for drugs. As many as 10 to 20 vehicles will be broken into on any given night by one or two people. The other crime type on the rise is shoplifting. “Again ,what we are seeing is criminals shifting from residential break and enters to stealing from stores. The risk of detection for shoplifting is less and the and sentences being doled out by the courts are considerably less than what would be given out for breaking into a home” said O’Brien. Other areas of interest that showed an increase were in drug trafficking and drug production, both up by 17 and 15 percent respectively. Both increases being attributed to the tenacious effort of the Municipal Drug Unit and Green Teams in in targeting street level drug dealers and marihuana grow ops respectively..
Nanaimo Traffic stats for 2009 also showed an increase of almost 30 percent in the apprehension of impaired drivers .”This increase can be attributed to the hard work of our traffic and general duty members but is also due to the increase in manpower within the Traffic section from the year before. 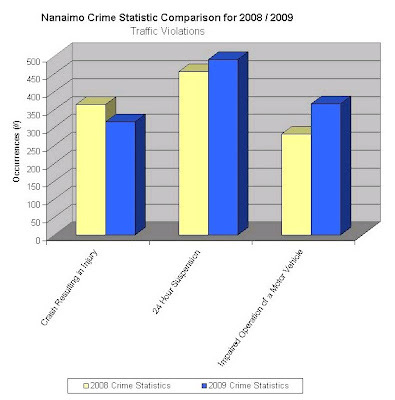 Other crime prevention initiatives such as the Bait Car Program ,targeting of Prolific offenders and the proactive work of the Bike Unit are also reflected in the statistics said O’Brien.’We are always thriving to do better, that’s the nature of police work .We are however confident that the commitment by the officers serving Nanaimo is 100 percent and with the expected increase in manpower this year and crime prevention initiatives already in place , 2010 will not be a good year for criminals operating in Nanaimo” said O’Brien. In the wake of the earthquake disaster in Haiti, opportunities to donate via text message are popping up across the web. Better Business Bureau (BBB) advises donors that giving through text can be a safe and easy way to give—but you should still use caution. Within days following the disaster in Haiti, it was widely reported that more than $3 million was donated through text message to such organizations as the Red Cross and others. Confirm the number directly with the source. While BBB has not yet heard of any scams relying on text message donations, this emerging method for donating is ripe for exploitation by scammers. Be aware that text donations are not immediate. 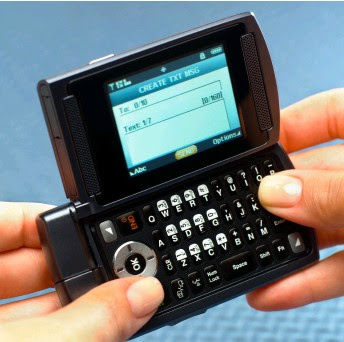 Depending on the text message service used by the charity, text donations can take anywhere from 30-90 days to be transferred to the designated charity. If you would like the donation to be received immediately by the charity, you can give online through the charity Web site, by calling the charity directly or by sending a check in the mail. Review the fine print. When you give to a charity through text message, you might also be signing yourself up to receive text message updates from the charity in the future. A charity should include the details of its text campaign on its Web site so you can see what you’re signing up for and how you can opt out. Research the charity. Giving wisely to a charity isn’t just about making sure that the solicitation isn’t coming from scammers. Wise donors make sure their donations are going to charities that are best equipped to help in the relief efforts and will responsibly use the money for its intended purpose. “Haiti” to 45678 to donate $5 to the Salvation Army in Canada (Canada only). According to Mobile Giving, 100 percent of donations will end up in the hands of the recipient charities. In Canada, the service is available to Bell, Rogers, Fido, and Solo Mobile customers. The best resource for consumers to check out for making donations is at the Foreign Affairs department: using this LINK. Bell Built Homes have specialized in residential construction since 1997 and offer custom home building, renovations, putting on an addition or any other project related to home construction. We employ qualified, ticketed tradesmen who are passionate about their craft and put pride in everything they do. We welcome the opportunity to show you what quality and professionalism looks like. Call today for a free estimate and no obligation consultation, 250-616-4347 or visit our website by clicking the above graphic or using this LINK. Is 4% An Acceptable Tax Increase For Nanaimo? Can They Do Anything But Increase Taxes ?? You have to wonder why governments at all levels think they can just keep spending more and more money and continue to increase taxes. Sooner or later the chickens will come home to roost and society is going to have to pay for this uncontrolled spending. Stephen Harper is warning Canadians to prepare for belt-tightening at two levels of government, noting the provinces are in the same financial straits as Ottawa and will likewise be forced to cut back spending. “I suspect the provinces will have to make some of the same difficult decisions we are making, and to control their spending in the years in the future,” the Prime Minister told reporters in Truro. So, at a time when the Prime Minister is telling us we need to reign in government spending, our local council is still planning on increasing taxes by 4% this year, and more increases are budgeted for the next five years. The provincial government has found it necessary to grab another handful of taxes using the HST which is coming this year while at the same time increasing the costs to pensioners in retirement homes. Sooner or later the well is simply going to be dry and the debts we keep running up will have to be paid. Maybe this council and those of it's generation are hoping the problem will not be theirs to solve and will simply pass on our irresponsible spending habits to the next generation. 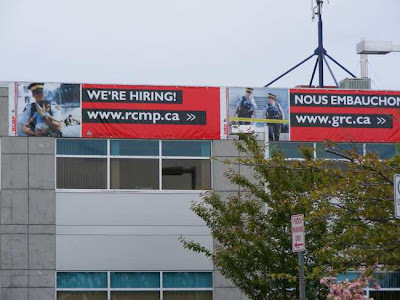 More RCMP Needed For Nanaimo? Recently the local RCMP Inspector told city hall we need more officers to give proper service to Nanaimo, where apparently the workload is higher than the provincial average. One of the reasons given is the extra manpower it takes to comply with the PRIME reporting system put in place by the provincial government. It seems that paper work under the new system requires 30% more time resulting in more time pushing paper and less time available rendering services. The task of attending fender benders has been taken from the RCMP and given to the local fire department as they attend accidents anyway and can handle the routine mishaps. So considering the above, why can our local detachment send 24 officers which represents 16% of the force to help police the Olympics and according to local RCMP spokesman it will not affect policing levels in the city? With the assistance of Emergency Response Team(ERT) members ,Nanaimo RCMP officers arrested a violent offender this morning wanted on a variety of charges including attempted murder. Gary Kenneth MILLS age 54, the subject of an arrest warrant since 2008, was arrested in the parking lot of the 7-11 on Departure Bay by ERT members early this morning. “Our office was made aware he was in our community. Because of his background and propensity for violence, surveillance was established and a decision was made this morning to effect his arrest, utilizing ERT” said Constable Gary O’Brien media spokesperson for the Nanaimo RCMP. “Public safety is paramount in any arrest, the use of ERT today demonstrated that” said O’Brien. MILLS was arrested without incident then transported to the Nanaimo Provincial courts where he will eventually be escorted back to Fort St John. MILLS was charged after an incident in originating in 2007 in Fort ST John where he allegedly shot a male. He was later arrested by RCMP in that community but was then granted bail. He later moved to Texada Island where he had been residing until his disappearance in late 2008. Nanaimo unit house sales increased by 102% when compared with December 08 with 85 units sold compared with 42 last year. House prices in the Nanaimo market have edged up slightly by 1% compared with last year but have risen 3.6% when compared with the previous month. 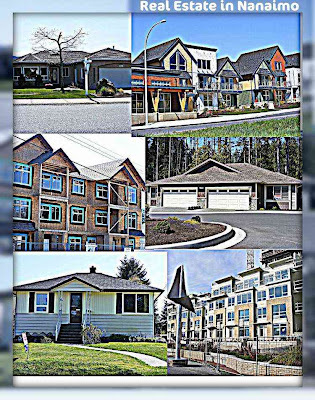 Based on average MLS sales summaries for Nanaimo and other Canadian cities for December 2009. 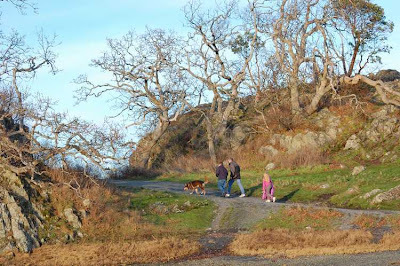 Having to put on jackets but being careful not to do them up for fear of overheating, Nanaimo residents are having to endure another harsh west coast winter! As witnessed yesterday at Piper's Lagoon Park, these brave Nanaimo souls dressed themselves against the elements and bravely ventured into the harsh outdoors. Midday temperatures had dipped to a bone chilling 10 degrees Celsius or 50 degrees Fahrenheit but in spite of these adverse conditions some fearless souls left the comfort of their homes and pitted themselves against nature. Seriously though, the last few days have been a delightful break from that liquid sunshine the west coast is famous for and I would encourage one and all to get out and visit your favourite Nanaimo spot. 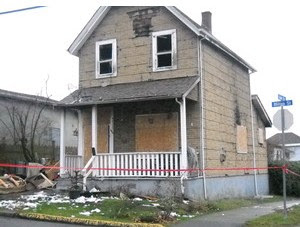 Nanaimo RCMP have one male in custody after an early morning blaze yesterday morning in the 900 block of Milton St that left three people homeless.Nanaimo Fire crews were already on scene when officers arrived. All the residents of the home had safely made their way out and had taken up shelter at a neighboring home. The only injuries reported from the fire involved a 21 year old female living in the home. She was taken to hospital suffering from minor smoke inhalation. She was transported to hospital by BC Paramedics ,examined then later released. “Based on information obtained at scene by our members , officers attended to a secondary residence and arrested a 47 year old male for uttering threats. The fire is deemed suspicious in nature and further charges my be laid” said Constable Gary O’Brien media spokesperson for the Nanaimo RCMP. The name of the male arrested yesterday morning after a suspicious fire that left three pesons homeless has been identified. Wayne Keith MILLIGAN age 47 a resident of Nanaimo, has been charged with two counts of Uttering threats.The first count alleges he uttered threats to cause death and alleges he uttered threats to burn a structure. MILLIGAN has been realeased from custody and is scheduled to make his next court appearance on February 17th . "Our investigation is continuing and we are asking anyone who saw anything suspicious near the residence, prior to the fire being reported at 6:00 AM , to call our office at 250-754-2345 or Crime Stoppers at 1-800-222-8477(TIPS)"said Constable Gary O'Brien ,media spokesperson for the Nanaimo RCMP. Over the past several weeks, many drivers have seen the advertisements and highway signs reminding them they can no longer use hand-held cellphones and other electronic devices while driving in B.C. As we approach the end of the one-month grace period, the Province, ICBC and police are reminding drivers to adopt smart driving behaviours. Driving is a complex task that requires our full attention. When you are behind the wheel, anything that competes with your attention will impair your ability to notice what’s going on around you, increasing your risk of being in a crash. The goal of the new law is to make our roads safer for everyone and we all play an important role in that. 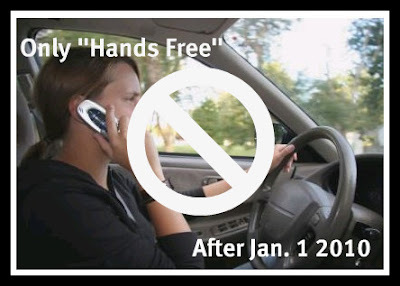 Here are some smart driving tips should your cellphone ring while you’re driving. Let it go to voicemail. Better yet, turn it off to avoid the temptation. Be a role model and help create a culture where friends, family and colleagues don’t expect you to pick up right away. Let callers know on your voicemail that you may be driving and there may be delay before you return their call. Ask your passenger(s) for help. If you're travelling with someone else and your cellphone rings, ask them to take the call for you. Pull over before you answer or return a call. Your life and the life of people around you are much more important than your phone call. Focus on the road. Multi-tasking while driving has become a common practice, but studies show that drivers who talk on a cellphone lose about 50 per cent of what's going on around them, visually, and are four times more likely to get into a crash. Maintaining focus on the road should be a driver’s priority. Ask your caller if they’re on the road. If you’re returning a call, and you suspect your caller is driving, set an example and suggest talking when it’s safer to do so. We all have a responsibility to make our roads safer. Keep a consistently safe speed - research shows drivers on cellphones tend to vary their speed up and down. Make sure your device is securely fixed to your vehicle and doesn’t obstruct your view. Safe driving is about making smart driving decisions – driving is a complex task that demands all of our concentration if it is to be done safely. Be a role model and set an example – your smart decisions can have a significant influence on others. 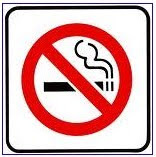 January 17 to 23 is National Non-Smoking Week across Canada, and B.C. leads the way on a number of fronts in helping to keep the province smoke-free. “Government is committed to helping British Columbians achieve their best health possible, which is why we’re involved in a number of healthy living initiatives, including our strong support for the smoke-free Vancouver 2010 Olympic and Paralympic Winter Games,” said Ida Chong, Minister of Healthy Living and Sport. Tobacco is not promoted to youth in stores. All school grounds are tobacco-free. Indoor public and work spaces such as restaurants are smoke-free. All indoor venue areas and outdoor seating sites. Catering areas and living quarters in the Athletes’ Village. Transportation connected to the Olympic and Paralympic celebrations. 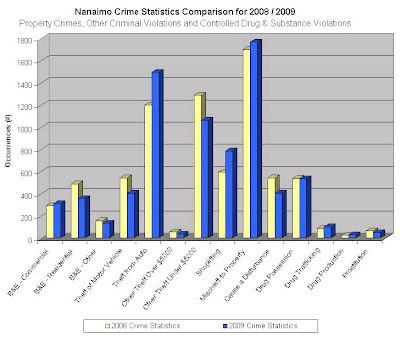 According to the 2008 Canadian Tobacco Use Monitoring Survey, B.C. currently has the lowest smoking rate in Canada. A 27 year old resident of Nanaimo is in police custody after being arrested late Friday night in connection with the seizure of over a pound of cocaine and $1000's of dollars in cash. Ryan James TRUCKLE age 27, known to local police and believed to be active in the local drug trade was arrested shortly after 11 PM on Saturday night by Nanaimo Drug Unit officers .He was arrested while sitting in his vehicle with three other men in the parking lot of the Longwood station plaza in the north end of Nanaimo. The three along with TRUCKLE were arrested and a search of TRUCKLE’s vehicle located a little over 500 grams of powdered cocaine and $12,000 dollars in Canadian currency. “Any time you take over a pound of cocaine and $12,000 dollars from illegal gains, off the street ,we call that a good day in the world of crime reduction” said Constable Gary O’Brien media spokesperson for the Nanaimo RCMP. 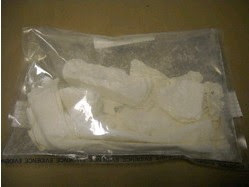 The four males were all charged with Possession for the Purpose of Trafficking under the Controlled Drugs and Substances Act .The three arrested, with ages of 24.28, and 53 were released later from cusotody on Promises to Appear and are scheduled to make their first court appearance in Nanaimo Provincial court on April 13,2010. TRUCKLE will be making an appearance in Nanaimo Provincial court today where a decision will be made on his release. 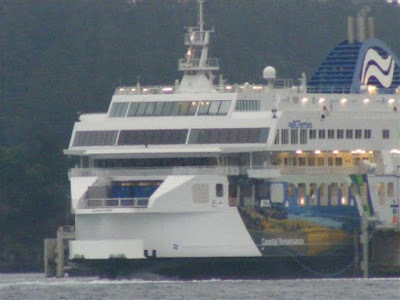 The 8:30am sailings from Departure Bay and Horsehoe Bay have been cancelled by BC Ferries dues to the high wind hazard. To check current Nanaimo sailing conditions use this Nanaimo Info Link. To read the cancellation notice posted at 6:22 am this morning use this LINK. For more complete information regards schedules and fares etc. use this Nanaimo Info LINK. City Council is patting itself on the back for keeping our tax increase down to a measly 4% after removing expenditures from the budget. City staff apparently identified $1.8 million which could be cut but council opted to eliminate only $844,000. Staff also is patting itself on the back for not filling two redundant management positions and finding other money saving opportunities where tax dollars had previously been wasted. How much money could be saved if the general taxpayer were not paying $500,000 to help people attend shows at the Port Theatre, nearly $1,000,000 to prop up the convention centre and the incidental amount of $500,000 to pay a city manager to not work for two years. There, in only three items, I identified more tax saving than city staff has identified in months of 'scouring' their departments. Does anyone really care how their tax dollars keep being spent? How long can people not working for government keep supporting an ever increasing, highly paid civil service where efficiency is not part of the job requirement? Is the goose still hissing or has it died? The amount of sustained rains we have had over the past several days could be creating water problems around your house you are not aware of but could cause serious damage. 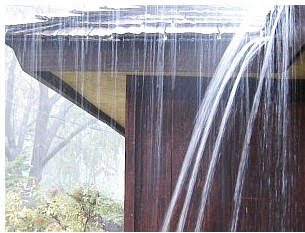 If your gutters are not clear and free flowing, the excess water will begin to overflow the gutter and as a result will collect along your house's wall rather than running off in the drainage pipe where it is intended to go. This can result in water coming into your basement or crawl space which is usually nice and dry when the water is directed away as it should be. If you are able, take a walk around your house and simply observe what your gutters are doing. Can you see water running over the tops of the gutters or overflowing at the end of the troughs? Can you hear water running down the downspout? Is the water all going into a drainage pipe or at least being directed away from your house where the downspout comes to the ground? Have you checked your basement or crawl space lately? If you have a traditionally wet basement, have you checked to see if the sump pump is doing it's job? If you have gutter issues, unless you are really, really comfortable with ladders or walking on wet roofs, you should call a professional to deal with your problem. Anyone in the gutter cleaning business, usually associated with window cleaning should be able to safely clear plugged gutters at a reasonable cost. Remember, water damage can result in extreme cost depending on what kind of trouble it starts. A damp basement can be the perfect breeding ground for molds and mildew which you really don't want in your house.